Jennys from World War I became the first aircraft used in regular service by the U.S. Post Office Department. The Curtiss JN-4 "Jenny" on display at the Udvar-Hazy Center in Chantilly, VA. Designed as a trainer for the U.S. Army Air Service, the Curtiss JN-4 first flew in 1916. Known popularly as the “Jenny,” the JN-4 taught thousands of Allied pilots to fly during World War I. After the war, surplus Jennys were widely used for “barnstorming”—traveling air shows—and they opened the first scheduled air mail service.The JN-4D featured a 90-horsepower Curtiss OX-5 engine. The Army ordered Curtiss to convert six JN-4Ds for the U.S. Air Mail Service by installing a larger 150-horsepower Hispano-Suiza engine and a mail compartment. 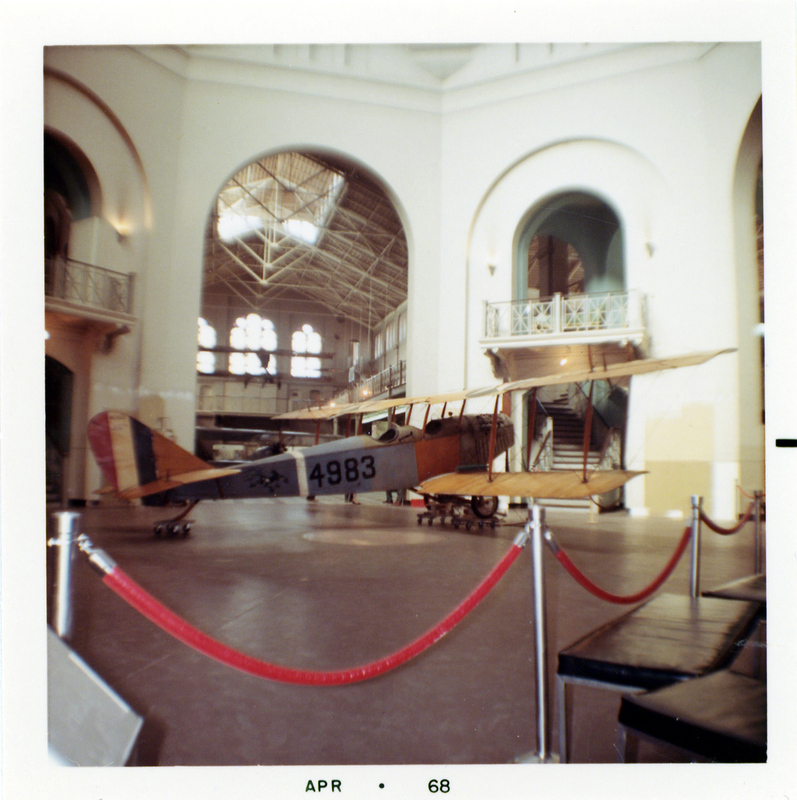 These airplanes were redesignated as JN-4Hs.The Smithsonian acquired this Jenny in 1918. The Curtiss JN-4D Jenny at the Steven F. Udvar-Hazy Center awaiting reassembly and placement on permanent display. The aircraft was on display at the Museum on the National Mall in the "America by Air" exhibition until Nov, 2009 when it was moved to the Udvar-Hazy Center. The Curtiss JN-4D is almost synonymous with American aviation in the 1920s. The Jenny, as it was affectionately called, appeared in 1917. Heretofore having only produced pusher aircraft, Glenn Curtiss hired an experienced European designer to lead the new project named B. Douglas Thomas, who had worked for Avro and Sopwith in England. The Jenny performed admirably as a trainer for the U.S. Air Service during World War I, but its more significant role in aviation history was as a barnstorming and mail-carrying airplane in the 1920s. Large numbers of relatively inexpensive war surplus Jennys were available in the United States after 1918. Its affordability, ease of operation, and versatility made the Jenny the signature airplane of the barnstorming era. The Smithsonian acquired this Jenny in 1918 directly from the U.S. War Department. It is one of the finest remaining examples of this truly classic airplane. One of the most famous of all aircraft is the Curtiss JN-4D, popularly known as the Jenny. More than ninety percent of American pilots trained during the First World War received their primary instruction on the Jenny. After the war, thousands of these aircraft were sold at surplus prices on the civilian market. The Jenny, powered by the equally famous Curtiss OX-5 engine, became the principal aircraft flown by barnstormers during the postwar period. Americans, particularly in rural areas, thrilled to the antics of these pilots performing in the aerial circuses that toured the country during the 1920s. For many, the Jenny would be the first airplane that they would see close-up, and those with a few dollars in hand and their fear in check, typically would make their first flight in a Jenny. The Curtiss JN series began as a hybrid design in 1914, incorporating the better features of the Model N designed in America by Glenn Curtiss and the Model J designed in England by a young engineer named B. Douglas Thomas. Thomas had been employed as an assistant chief engineer with Sopwith Aviation when Curtiss met him on a trip to England. Impressed with Thomas' aeronautical knowledge, Curtiss hired him and commissioned him to design a two-seat, tractor airplane around the Curtiss-built OX-5 engine. Thomas' Model J and Curtiss' Model N were both entered in the U.S. Army evaluation trials in September 1914. Curtiss received an order in December 1914 for eight modified Model Js. Curtiss added the letter N to the designation because the modified Model J incorporated significant features of his Model N. The designation officially became the JN-2. In March 1915, Curtiss began construction of a 110,000-square-foot factory in Buffalo, New York. This factory ultimately produced Jennys at the rate of 100 per month. The First Aero Squadron of the U.S. Air Service, Signal Corps, began receiving JN-2s in early 1915. Some of these aircraft were deployed to Mexico one year later where they performed the first tactical operations for the fledgling U.S. Air Service in the campaign against Pancho Villa. The JN-2s had equal span wings with four strut-connected ailerons controlled by a shoulder yoke located in the rear cockpit, much like that found on Curtiss' early pusher designs. The performance of the JN-2 was less than satisfactory, so Curtiss improved the design with the substitution of unequal span wings (like the original modified Model J), and ailerons on the upper wings only with a wheel to control them in place of the outmoded yoke system. In addition, a foot bar was installed to control the rudder. The improved design was designated the JN-3, and this model caught the interest of British authorities who were then seeking primary trainers for the Royal Naval Air Service. In order to meet this and anticipated future British wartime requirements, Curtiss built a production plant in Toronto, Canada. With a few further revisions, the airplane appeared as the JN-4 in mid 1916. JN-4s were acquired by the British as trainers and several were also supplied to the U.S. Air Service, as well as to Curtiss flying schools and private owners. A total of 701 were built. The JN-4 was quickly followed by the JN-4A, which incorporated several significant changes. It had larger and redesigned tail surfaces to increase directional stability, a revised fuselage introducing significant down thrust to the OX-5 engine, increased dihedral, and ailerons on both wings to improve lateral control. Six hundred and one JN-4As of a total of 781 built were delivered to the U.S. Air Service. The rest went to the Royal Flying Corps, the Royal Naval Air Service, and a few to the U.S. Navy. Canadian-built Jennys, derived from the earlier JN-3 model, incorporated certain features requested by Canadian authorities. These included a control stick instead of a wheel, a revised tail, and strut-connected ailerons on both wings. This model, which first flew in January 1917, became known as the JN-4(Can), or more popularly, the Canuck. The Curtiss plant in Toronto that had been building JN-3s for the British was taken over by the Canadian government in December 1916, and reformed as Canadian Aeroplanes, Ltd.
Curtiss continued the process of evolutionary design changes to the JN-4. The JN-4B (actually an earlier design than the JN-4A) saw some success in the civilian market, as well as with the U.S. Air Service and the U.S. Navy. The JN-4C was fitted with experimental wings, but only one was built. The JN-4D, the definitive design of the JN series, was introduced in June 1917, just one month after the United States entered the First World War. Principal design changes for this model included a control stick substituted for the control wheel, ailerons only on the upper wing, and curved cut-outs on the inner trailing edges of all four wing panels. This last change provided easier cockpit entry and egress. Wartime demand for the JN-4D quickly outstripped Curtiss' production capacity and the U.S. Air Service let contracts with six other American manufacturers: Fowler Airplane Corporation, Liberty Iron Works, Springfield Aircraft Corporation, St. Louis Aircraft Corporation, U.S. Aircraft Corporation, and Howell & Lesser. Canadian Aeroplanes, Ltd., was also called upon to deliver JN-4 Canucks under an existing contract for JN-4Ds, in order to meet the dramatic increase in wartime demand. The U.S. Air Service found more applications for the JN-4 and this resulted in another JN variant with a more powerful engine. A requirement for an advanced trainer led to the development of the JN-4H, with a 150-horsepower Wright-Martin-built, Hispano-Suiza engine in place of the 90-horsepower Curtiss OX-5. The JN-4H, with a strengthened structure and increased fuel capacity, spawned a number of purpose-built variants, including the JN-4HT, a dual-control trainer, the JN-4HB, a bomber trainer fitted with bomb racks, and the JN-4HG, a single-control gunnery trainer. Further minor improvements in the JN-4H series led to the JN-6H, the principal change being a reversion to strut-connected ailerons on both wings. The U.S. Navy procured 201 JN series aircraft during the period 1917 to 1923. Most of these aircraft were JN-4Hs received from U.S. Air Service stocks, and they were used by the U.S. Navy and Marine Corps as landplane trainers. The Navy also adopted a modified Jenny, designated the N-9, for primary seaplane training. These aircraft, fitted with a pontoon and wingtip floats, were powered by Hispano-Suiza or Curtiss OXX engines. Five hundred and ten N-9s were purchased from the Curtiss and Burgess companies, although Naval air cadets disliked the under-performing N-9. The final iteration of the JN series was the JNS, or Standard Jenny. This designation, appearing in 1923, was used to identify obsolescent JN-4H and JN-6H models that were rebuilt and modified, with a reversion, once again, to ailerons on the top wing only. This model was powered by either the 150- or 180-horsepower Hispano-Suiza engine built by Wright Martin. Standard Jennies would remain in limited service until finally withdrawn in 1927. In November 1918, contracts for war material were abruptly terminated and the U.S. government began to dispose of surplus stocks to the civilian market. There was a substantial demand for the surplus aircraft and the government invited bids from the manufacturers and others with overhaul and repair facilities. Curtiss bought back $20 million worth of equipment, mostly Jennys and OX-5 engines, at a cost of 13 cents on the dollar. Curtiss quickly began refurbishing and aggressively marketing these aircraft. The British, in the meantime, were moving even more quickly to dispose of their surplus inventory, and hundreds of Canadian JN-4 Canucks began to flood the American market. work, and pleasure flying, proclaiming that "the JN is a good machine for the sportsman. It stunts well and develops great speed as compared with land conveyances. It has been used in all the exhibitions by the U.S. Army flyers, and by most of the flyers who have exhibited since the close of the war." It was this last application that would make the Jenny an enduring legend. The Jenny, and to a lesser extent, the Standard J-1, would be the principal aerial mounts for those gypsy fliers called barnstormers. During the 1920s, civilian pilots roamed the countryside, giving passenger rides and putting on aerial circuses that drew hundreds of people, making as much as $300 a day. The slow flying Jenny was perfect for wing-walkers who clung to the Jenny's maze of struts, the straight wheel axle, or the king posts above the wings while performing death-defying stunts for the crowds below. Pilots found a myriad of ways to improve the performance of their Jennys, which included clipping wings or adding high-lift monoplane wings, using more efficient propellers, and replacing the 90-horsepower Curtiss OX-5 engine with a 150-horsepower Hispano-Suiza, or any one of a number of other widely available surplus engines. Pilots could also enhance the performance of their OX-5 engines by installing conversion kits that included silver-bronze bearings; three-ring, high-compression pistons; perfect circle piston rings; new magnetos; replaceable valve guides and seats; new valves and intake controls; roller rocker arms; and grease-tight and fail-proof intake rocker arms and pins. Thirty-eight hundred of these Miller conversion kits, named after their developer, were sold. Jenny prices continued to drop as the air services began selling surplus stocks directly to the public and used Jennys would eventually change hands among private owners for as little as $50. Unused OX-5 engines sold for $250. By 1925, new and more efficient designs were being offered to a more affluent and demanding public, and interest in the Jenny began to wane. Two years later, newly instituted Federal airworthiness requirements for both airplanes and pilots brought the Jenny and Barnstorming Era to a close, for the venerable Jenny could not meet the requirements. By 1930, Jenny hulks and components could be found all over the country. 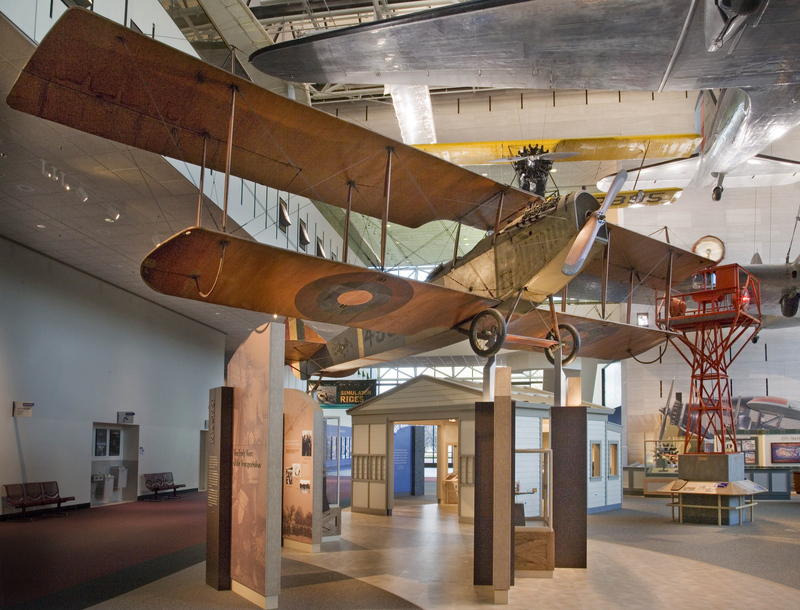 On November 25, 1918, only days after the Armistice, the Smithsonian Institution acquired a JN-4D Jenny from the U.S. Air Service for the national aeronautical collection. This aircraft, one of 585 built under license by the Springfield Aircraft Corporation of Springfield, Massachusetts, and costing the government $4,954.34, had been briefly in use as a U.S. Air Service trainer at Hazelhurst Field at Mineola, New York. The serial number of this aircraft, 4983, marks it as among the first twenty-five JN-4Ds shipped to the U.S. Air Service from Springfield's factory in April 1918. The OX-5 engine, serial number 8838, was built under license by the Willys-Overland Corporation and delivered to Springfield Aircraft in March 1918. Single-engine, two-seat, U.S.-built World War I trainer aircraft; 90-horsepower Curtiss OX-5 engine. Tan wings, brown and blue fuselage.